Skins are used to apply alternative sets of materials to a model. Typical examples are the butterfly model, where a single mesh is used with multiple skins to implement several species of butterflies; or a monster that exists in tame, mean and hellborn variants. 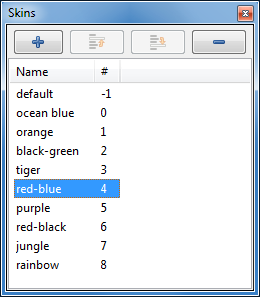 Skins are defined and edited in the Model Editor as described below. The use of skins is up to the game's script or C++ code. The Skins pane lists all skins in the model. A single click on a skin selects it, a double click opens the Skin Inspector pane as well. Pressing the F2 key or a single-click on an already selected skin allows you to rename the skin in place. The “+” button creates a new skin and adds it to the list. The “-” button deletes the currently selected skins. Rename allows to rename the skin. Add/create new, like the “+” button, creates a new skin and adds it to the list. 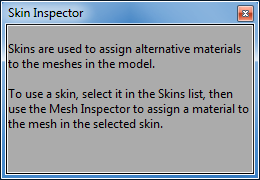 To use a skin, select it in the Skins list (shown above), then use the Mesh Inspector to assign a material to the mesh in the selected skin.